For long-time Disneyland Resort guests, it still might be hard to believe that only a few years ago, this area was home to an amorphous set of concrete planter blobs and a large metallic sun that many people nicknamed "The Hubcap." 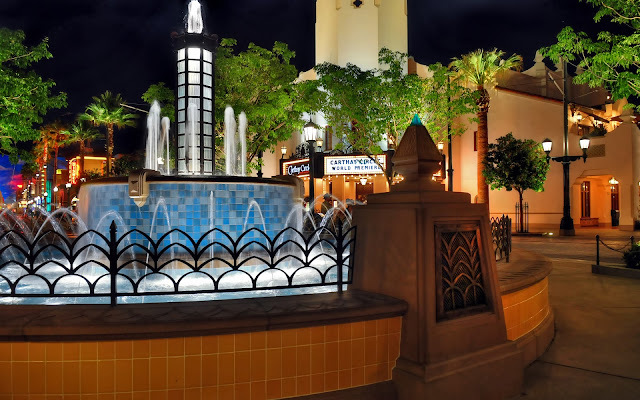 But what once was kitschy Sunshine Plaza is now elegant Carthay Circle, the focal point of Buena Vista Street, and the glamour of 1920s Los Angeles comes to a point right here. The beautiful fountain, a wonderful place by which to relax and take in the scenery, is stunning at night, and the beauty and majesty of this reimagined creates a most wonderful serenity. Next to the Carthay Circle Fountain at night.